My birthday list this year contained a random selection of items of an historical nature. It isn’t actually my birthday quite yet but I was instructed to order things on my behalf and they have been dropping on my door mat. Not for me jewels, perfume or even chocolate. What lady of mature (maturish) years would not want lanthorns (not something the spell checker missed – a lantern is literally a lant-horn, as it used horn to shield the flame from the wind), nefs (cutlery sets) and canvas buckets? Well I was very impressed by them anyway. Equally impressed that the vendor sent complimentary sweets with the package! Well done for customer service BA Blades. It is it surprising how the acquisition of shiny new advertising car magnets can concentrate the mind. I was keen to try out said magnets but this required a clean car, or at least a sufficiently large portion of the car upon which to affix a magnet. Breaking the habit of a lifetime, I hurled a bucket of water in the vague direction of the car. Most of the contents ended up over me but hey – I am all for multi-tasking and showering whilst car cleaning could catch on. Actually I am a little doubtful about the wisdom of cleaning the car – I am convinced that the dirt is holding it together. One of the magnets did get an outing though. This week saw Mistress Agnes’ final appearance for her former employer. Exciting times ahead as she is now firmly ensconced in the world of Swords and Spindles. If you know anyone who wants to be entertained by a slightly eccentric group of historical interpreters, just let her know – available for family and local history societies, heritage sites and events, schools, weddings and bar mitzvahs – well, most of the foregoing. If you want to spend a day in the seventeenth century, learning about researching in that century and about life at that time, I still have some spaces on my day course in Poundstock, near Bude on 25 April. Also this week, the arrival of the book about members of the Braund family who have lost their lives in conflict. I can take no credit for this one. In addition a meeting of Buckland Brewer History Group when an enthusiastic audience embraced our plans to conduct a mapping project for the parish. – warm fuzzy feelings abounded as I watched my friends and neighbours exclaiming over LIDAR images of their homes and gardens. Now I shall be heading north (I know, everywhere is north) to meet old friends and make new at the Guild of One-Name Studies’ conference, where I am leading an interactive session on publishing – happy days. It has been a very exciting week on the Swords and Spindles front, with the postman delivering not just shiny advertising signs to affix to the car but also various ebay acquired artefacts. Our initial approaches to schools (hampered by the steam driven internet) have been very positively received, so these are exciting times. We are now on Facebook and looking for ‘likes’ so, in the interests of shameless self-promotion, I am mentioning it – no obligation, just saying! Then there was a really bumper day post-wise when I found on the door mat not only the proof of a 1930s local history book that Buckland Brewer History Group are reprinting but even better, images of the whole 1941 National Farm survey for the parish. These were acquired on our behalf by a selfless volunteer (or maybe they just didn’t know how to say no to my tentative request!). This just goes to reinforce what I have always known, that family and local history fans are generous in the extreme. Whisper it very quietly but it does seem that my communications are restored to their former glory. After wasting another hour of my life listening to how important my call was, I manage to organise a repair to my telephone line. It was with great excitement that I saw the engineers’ van parked outside the following day. Shades of Marie Celeste, there were no repair persons in said van but a van nonetheless. Although this did restore my phone temporarily, it was merely destined to lull me into a false sense of security. It seems that they were actually repairing someone else’s phone. It was a further two days before the telephone engineer called to say my line was restored. Great, I thought, now my internet speed will return to normal, instead of being intermittent and so excruciatingly slow that pictures would not appear on many websites. Not so. A slight sense of panic at this point. Apart from the general frustration, one of my jobs is wholly dependant on vaguely decent (by rural standards) internet speed. To say nothing of wondering how I would deliver my remote presentations to Canada in my seriously pixilated state. Well, as I type (and I hardly dare say this) things do seem to have returned to that happy state we call normal. Now to catch up with all the tasks that have taken twice as long as they should over the last couple of weeks. Well, after a short period of ‘Shall we?, Shan’t we?’ Mistress Agnes is moving home. The pending closure of her previous location in Torrington meant that a decision had to be made. Should she continue appearing at history groups and social clubs, as she has done for several years, or should she and her friends be more proactive and expand their work to provide sessions for schools? Should we offer to fill the gap that would be left by the demise of our former employer? Knowing that this would mean a great deal of work and knowing too that if I do something I do it properly, there was a certain amount of thinking through whether I wanted to take this on in my ‘semi-retirement’. Thanks to continual changing of the retirement age, real retirement is still an increasingly long time ahead. This all also had to be done quickly so that we could strike whilst the iron was still warm, if not exactly hot. In the end it was a no-brainer so let me introduce you to the world of Swords and Spindles. We are so grateful to many people who have already supported us. My school friend, Jeanne Perrett, a talented artist, designed our logo in no time at all. Some of her beautiful and exciting art work can be seen here. 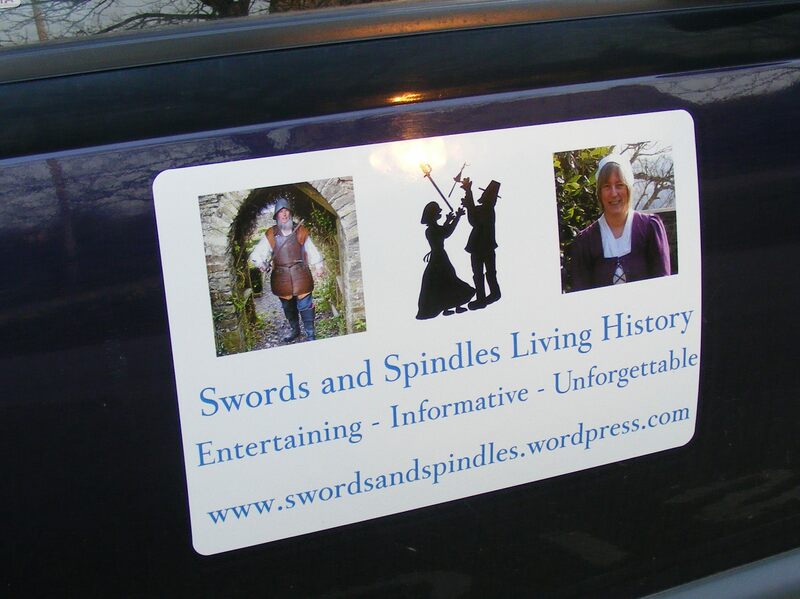 We have already had booking enquires and our Twitter following @swordspindles is building up. So thank you to all who have helped to spread the word. So what happens just when one is trying to set up a new business and one needs ones internet and telephone most? The telephone line dies completely. I cannot explain how I do still have an, intermittent and excruciatingly slow, internet connection but I do. After half an hour of ‘your call is important to us’ (but clearly not important enough for you to answer), I got through to a person to whom I could report the non-existence of my telephone. No fewer than seven times I told the same gentleman that there was no sound whatsoever when I lifted my receiver. Finally, after about twenty minutes, he has a light bulb moment and suggests sending an engineer. Unfortunately, at that point I lose the mobile signal. To be honest that was three days ago and I have lost the will to waste another hour of my life starting all over again. It is a bullet that will nevertheless have to be bitten. Working with young people in the seventeenth century is always entertaining and make you realise that, as L P Hartley said, ‘the past is (truly) another country’ and they do indeed ‘do things differently there.’ Mistress Agnes was explaining, to a group of eleven year olds, how clothes were made when one of her audience asked, ‘What is spinning?’ Another term to add to the list of ‘obvious’ words that need explaining. Spinning is I understand some new form of keep fit torture, not exactly Mistress Agnes’ forte. My time as a presenter on Unlock the Past’s Baltic Cruise is getting closer – the cruise even got a mention in The New York Times! Have you ever had one of those weeks? I recently arrived in a town not especially near me to deliver a talk and discovered that my notes were fifty miles away. Those of you who have heard me present will know that I don’t very often use notes but for this particular talk they were pretty necessary for the first twenty minutes. What to do? Could I wing it? Ah, then I realised that the text of the talk was on my computer, which I have with me for power point purposes. Fortunately I was early enough to copy up the basics on to a purloined piece of paper. This was more difficult than it sounds because I can’t read my handwriting at the best of times and this was not the best of times, as I was wearing contact lenses and had not brought my reading glasses. By extending my arms and squinting a bit, I managed with a combination of speed line-learning and scribbled headers in large letters. Hopefully my audience did not notice the join. Then I was due to present a Hangout-on-air. By its nature, this requires an internet connection. I returned from a few lovely days in granny mode to find that I had no electricity. An adjustment of the trip switch and it was restored – so far so good, hurrah. It turned out however that my router was deceased. I sneaked to the village shop, laptop in hand, to gain sufficient internet access to find the required telephone number. A quick call to an offshore call centre. ‘How old is your router?’ I am asked. Well I don’t celebrate its birthday but probably pretty old. Is this relevant? It is dead, whether it died of old age or not seems immaterial. ‘We will send a replacement in three working days.’ Unlikely, as this would be a Sunday but I am at their mercy. ‘Helpfully’ they tell me that I can track the progress of the delivery online. This does of course require me to be able to get on line. The good news was that it arrived within 48 hours. The bad news was that this 48 hour internet black hole coincided with my need to present the Hangout-on-air. I couldn’t even prevail on a neighbour, as it turned out that a severe local storm had knocked out numerous local routers. I did my best but sometimes technology (or lack of) gets the better of us. I have now had confirmation that I will be giving two presentations at the British Isles Family History Society of Greater Ottawa conference in September. These will be in person this time, so not dependant on the health of my router. For those who are waiting for the electronic version of my ’Til Death us do Part booklet on historic causes of death it is now available.